The temple in Jerusalem was a place of worship to the most High God. For the Jewish nation, it was the epicenter of everything they believed and held dear before the Lord. In the days of Jesus, it was the second temple following the destruction of Solomon’s temple in 586BC. Herod the Great, king of Judea, had begun an expansion of the temple restored by Zerubbabel to placate the atrocities of his rule over the Jews. The final building of the temple would be completed six years before the Romans in 70AD destroyed it. When the Passover of the Jews was at hand, Jesus came to Jerusalem and found the temple in a state of disarray. It was probably not the first time the Lord had found the temple in such a state. To the dismay of Jesus, the temple had become a place of commerce and trade. A contrast of pictures is given in John’s account. The magnificence of the temple of God cast as a backdrop to the busy commerce of trade and bickering by men making money from the worship of the Lord. Sacrifices were required in temple worship so men took advantage selling oxen, sheep and doves. It was like a huge farmer’s market or cattle lot. The lowing of oxen and the defecation of these large animals filled the air. Sheep bleating in the busy markets as they were sold in lots for sacrifices. Cages filled with doves to sell to the poor at exorbitant prices. This was not a place of quiet reflection to worship the Lord. The temple had become a place of merchandise. Jesus was furious. Gathering up strands of cord laying around on the floor, Jesus the Son of God made a whip and began to drive the oxen out of the temple grounds scattering the sheep among the people. 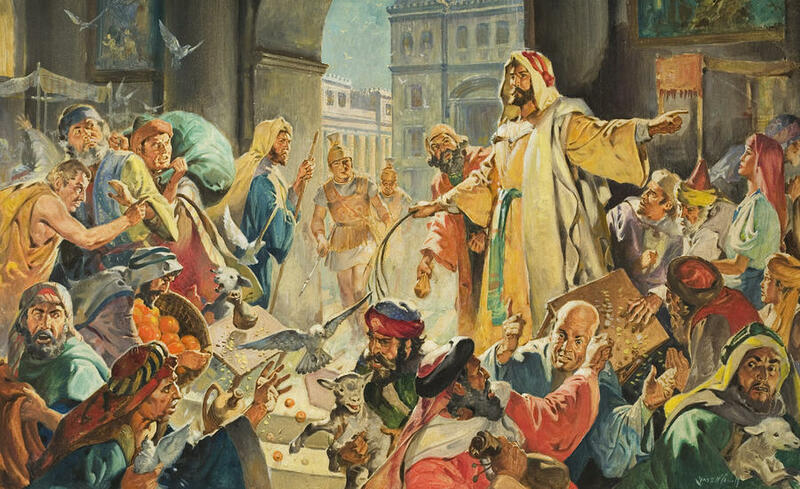 He demanded the doves be taken away as the Lord turned over tables of money spilling coins everywhere. The temple was in chaos. Jesus of Nazareth was cleaning out the temple of the putridity of man’s dishonor to His Holy Father. All of His disciples were shocked. They remembered the psalm of David as he was exasperated with the hypocrisy of man in their worship to the Lord. No one argued with Jesus. He had a whip. The temple was cleaned out. It was probably a short time after the dust settled the oxen, sheep and doves came back to the temple. The moneychangers set up shop again. Commerce continued as it had before. There would be no one from Nazareth to clean out the house of God. He would be nailed to a cross. The Romans would destroy the temple ending all the hypocrisy of the Jewish nation. Many would talk of the day the Lord took a whip and cleaned out the temple. We are still talking about it today. Religion has changed little from those days. The worship of God in the church has turned to be more of a place of commerce than a place of worship. It is a place to be entertained with loud music, food, frolic and satisfaction of the flesh. Worldly attractions draw men into a religion of commerce not unlike the selling of oxen and sheep in the days of Jesus. For the true worshippers it was hard to get into the temple to pray because of all the oxen, sheep and doves. Religion today is nothing but a house of merchandise where people expect to be fed, clothed, entertained and “would you please pay my bills?” If Jesus were here, He would have another whip. He would not bother with what most men call religion because they are not His house. For the church of the Lord He would do a lot of cleaning. His fury would be real. However, He will not come with a whip. He will return with angels. Then the final judgment will be given upon those who turn His house into a place of produce.